For those of you who have been consistently reading my blog for about a year and a half may remember our birthday celebration for Janet Stevens in January 2013. 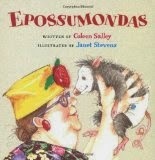 After reading many of her books it was the Epossumondas series that Stevens illustrated for Coleen Salley that resonated the most for my children. I planned a visit to our local zoo to meet a real opposum to bring the books to life! During my research for that birthday blog post, I discovered Coleen Salley's birthday and hoped that we would one day celebrate by revisiting one of our favorite picture book series of all-time! Coleen Salley was a champion of children's literature as a teacher, storyteller, and author. She was a professor of children's literature at University of New Orleans for 30 years beginning in 1964 and according to Best of New Orleans her classes "were always packed." In the mid-1970s she began sharing her gift of storytelling with children and adults. She captured the attention of groups of listeners all over the United States and the world! When she was in her seventies, she published her first picture book, Who's Tripping Over My Bridge? illustrated by Amy Dixon, a bayou-infused rendition of The Three Billy Goats Gruff. In 2002, she published Epossumondas with Janet Stevens. According to Booklist, Janet Stevens wanted the main character in Coleen's manuscript, a retelling of an old noodlehead story of Epaminondas, to be animal. She knew Coleen would need to be convinced of this idea. Stevens started with a pig, which would have made the book Epigamondas, but she decided on an opossum. Stevens also decided to cast Coleen as Mama for the book too and Coleen approved! This wasn't the first time that Stevens decided to cast Coleen as a character in one her books. She also included Coleen in her book To Market, To Market by Anne Miranda. 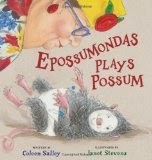 There are four Epossumondas books; Epossumondas, Why Epossumondas Has No Hair on His Tail, Epossumondas Saves the Day, and Epossumondas Plays Possum. The last of which was published after Coleen's death in 2008. Janet Stevens commented in an article published on NOLA.com about her last illustration in Plays Possum that shows Coleen (Mama) walking away with Epossumondas looking back, "That was goodbye. I still get kinda broken up thinking about her. We're glad we had her while we did." Coleen Salley made her mark on the lives of countless teachers, librarians, parents, children, authors, and illustrators. A memorial has been placed at Story Land in New Orleans in her honor. 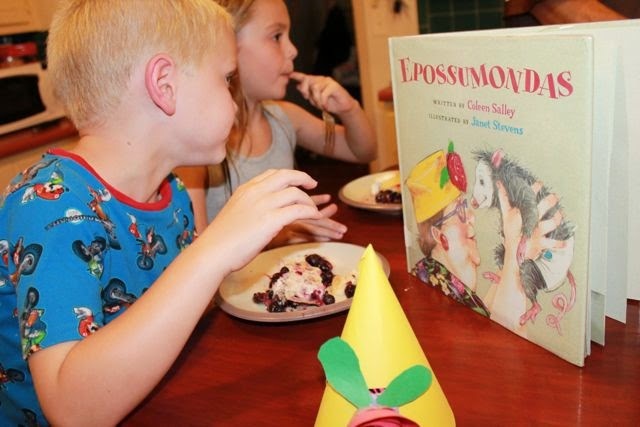 When we celebrated Janet Stevens' birthday by reading books from the Epossumondas in 2013 I never explained to my children that the Mama character in the book was actually Coleen Salley. This year, we discussed this as we made yellow hats with red roses which Mama (Coleen) wears in all the Epossumondas books. 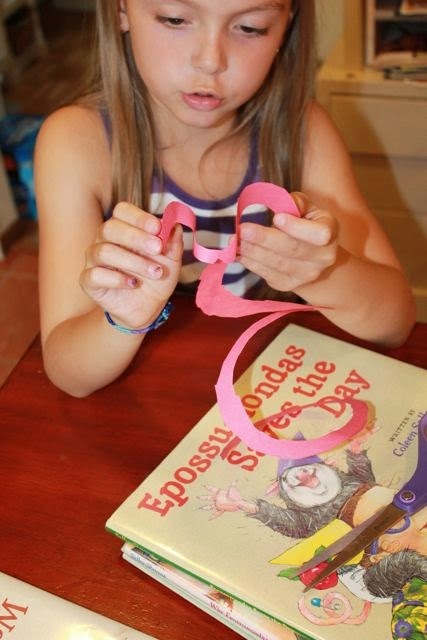 We made paper roses by cutting a circle out of red construction paper. My children cut the circle into a spiral. 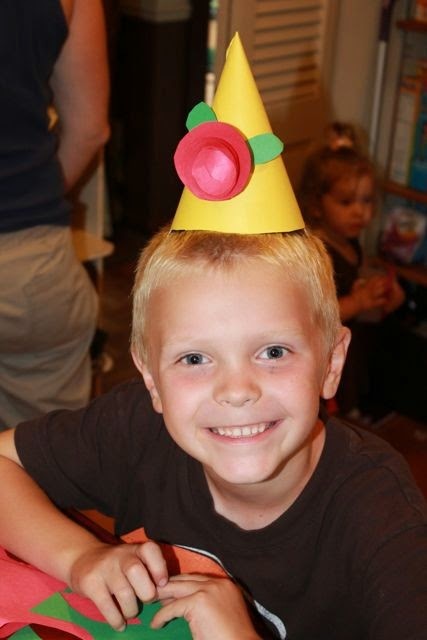 I covered a party hat with yellow construction paper and my son cut out a few green leaves to complete the hat! 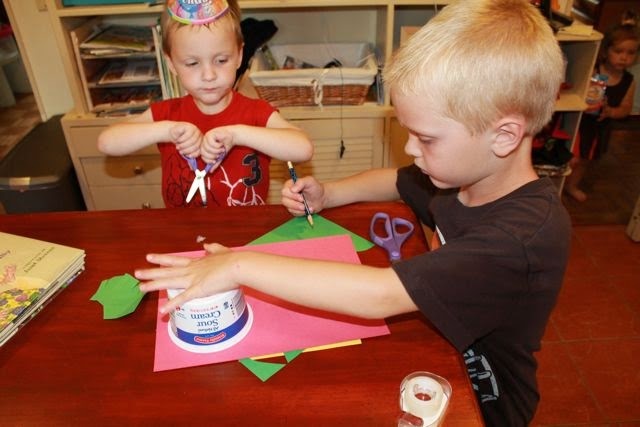 Why did we need to make party hats? 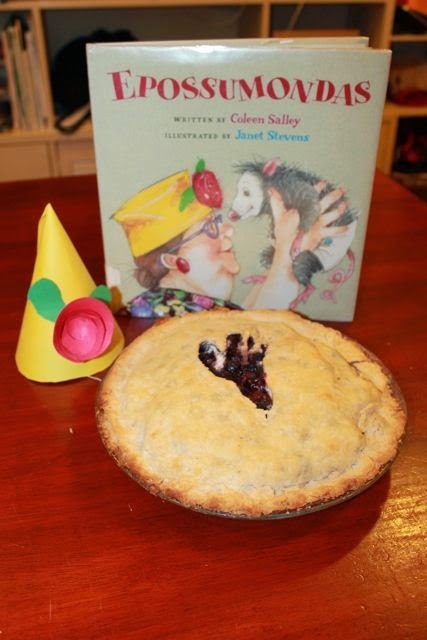 We decided the best way to celebrate Coleen Salley's birthday would be to read Epossumondas books, wear party hats, and eat blueberry pie. Why blueberry pie? 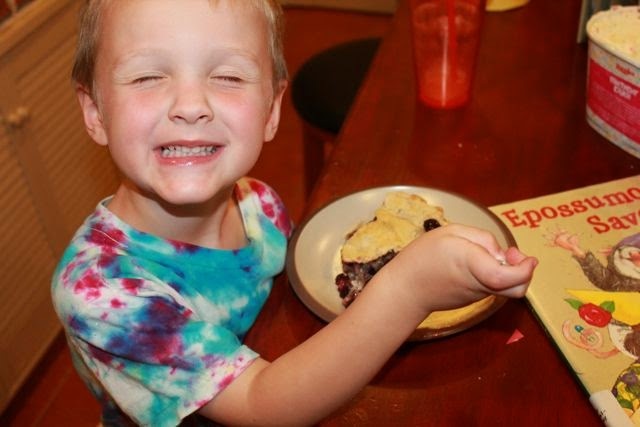 Well, Epossumondas may be his "mama's sweet little patootie," but he doesn't have the sense he was born with and at the end of Epossumondas he steps right in the middle of his mama's pies that were cooling on the porch! 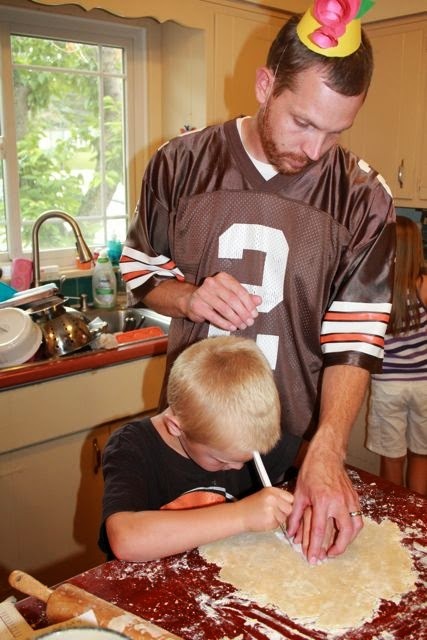 My son and I never made a pie before even though we are experts at baking and decorating birthday cakes! 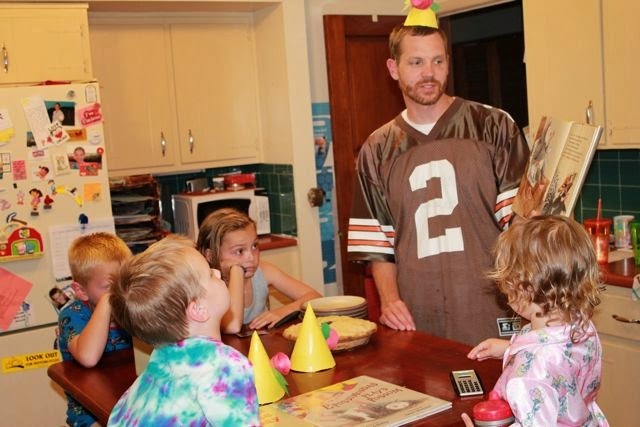 I was a little nervous because I have heard many stories about pies not turning out well. We had time to bake only one pie, so we needed to nail it the first time! 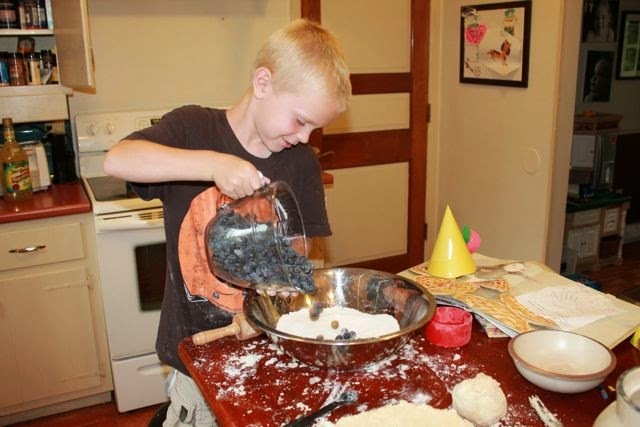 We used the recipe from our Betty Crocker cookbook for the crust and the blueberry pie. 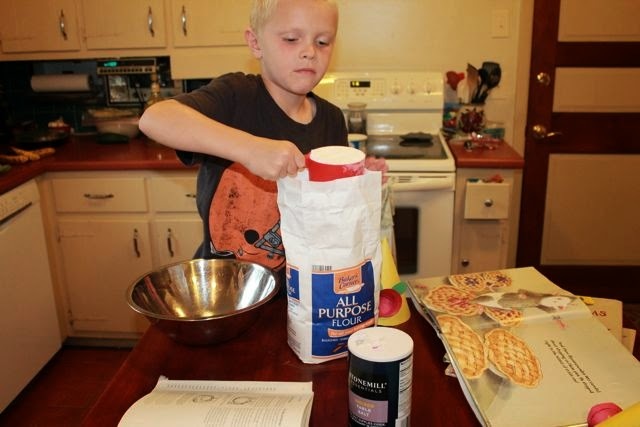 He was a master at cutting the shortening into the flour. 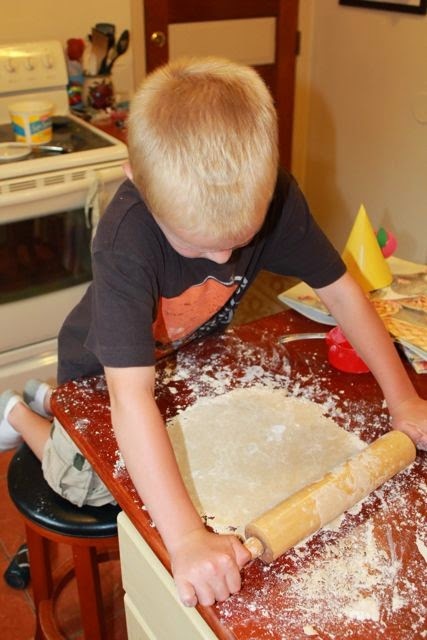 He even helped roll out the dough! 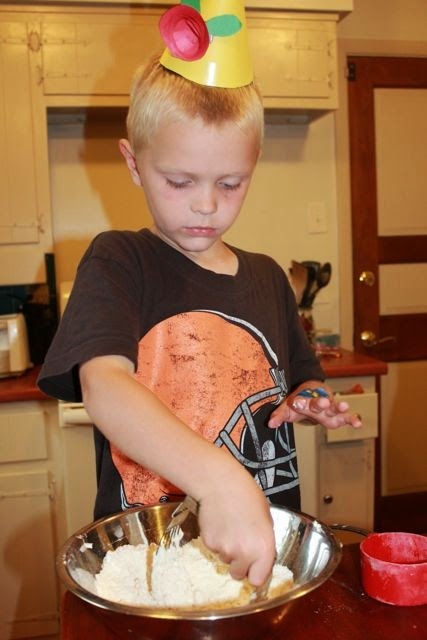 He couldn't believe the recipe called for 6 cups of blueberries! 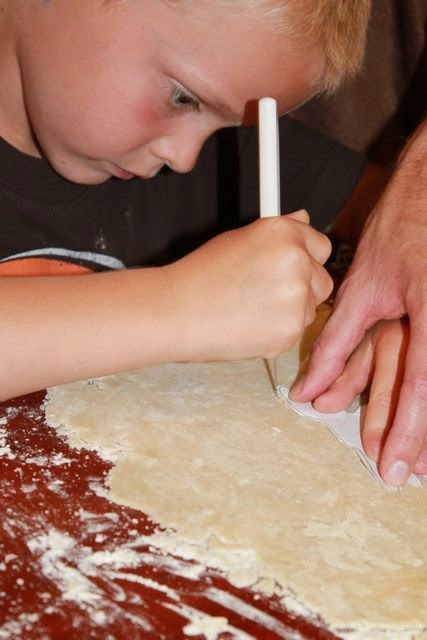 To make this pie extra special we carved Epossumondas' footprint in the dough for the top crust. I found the shape of opossum hind-footprint on bear-tracker.com and traced it onto a piece of paper that my son used to cut around. 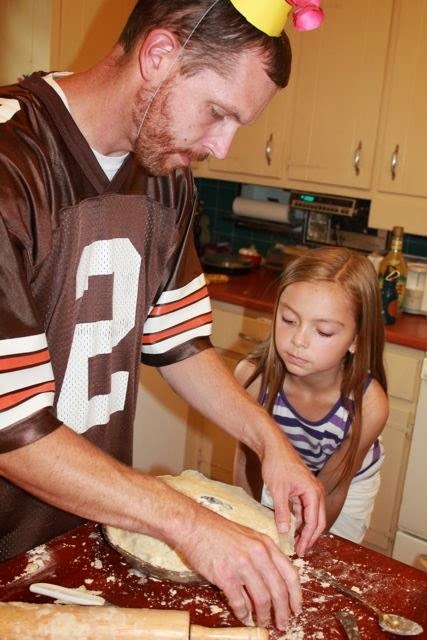 My daughter supervised as I placed on the top crust. My youngest son asked, "Is it done yet? It smells good!" 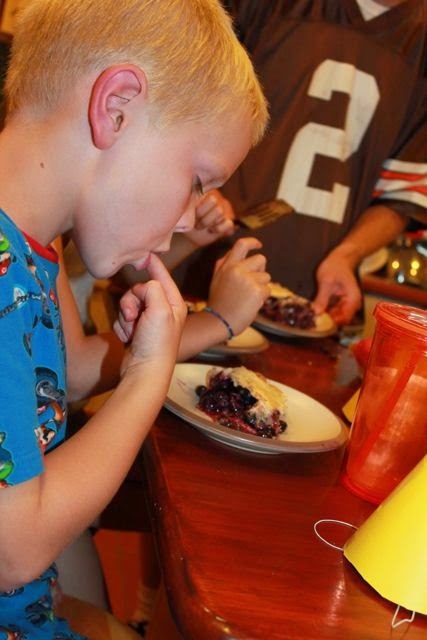 Hey, did Epossumondas step right in the middle of our blueberry pie?!?! Before we ate our pie we read Why Epossumondas Has No Hair on His Tail. Now we have read all the books in the series! "Dad, this pie is REAL good!" 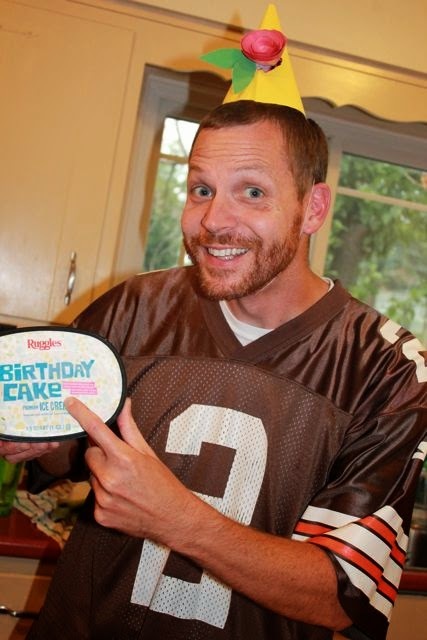 We topped the pie with Birthday Cake ice cream too! A yummy snack before bed! 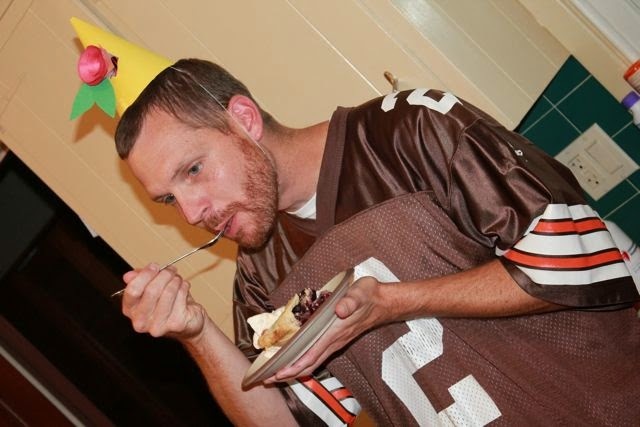 I think this was the first time I have ever had blueberry pie. It was delicious! 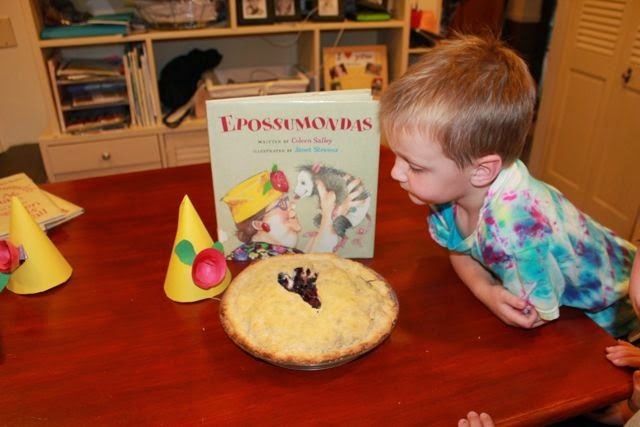 This little guy asked for the Epossumondas books to be read more than once this week! I believe Coleen Salley's love of reading will continue to brighten the days of children for many years to come. Mix sugar, flour, and cinnamon in large bowl. Stir in blueberries. Add filling to pie pan lined with the bottom crust. Sprinkle filling with lemon juice and top with butter that has been cut into small pieces. Place the Epossumondas footprint crust on top of the filling. Pinch edges of crust to seal in the blueberry filling. 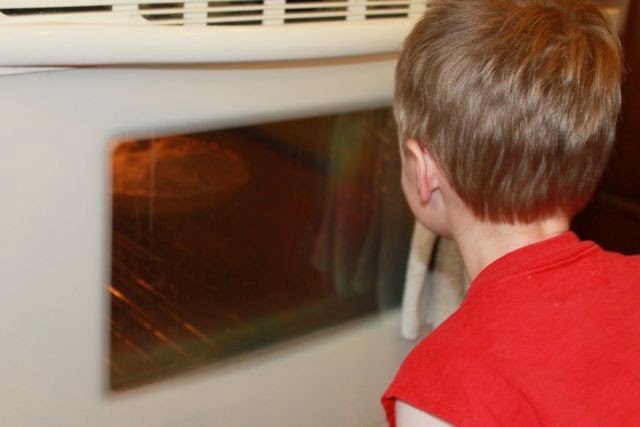 Bake for 35-45 minutes until crust is golden brown. Cool for a few hours before eating. Top with BIRTHDAY CAKE ice cream!! Look at all those blueberries!